Following the success of our inaugural Xchange 2018 conference in San Francisco in March this year, we decided to take the show on the road. Our first stop was Melbourne, Australia—Cyara’s birthplace and home to many of our founding customers. After a stop in Dallas, Texas, we moved on to Manchester in the United Kingdom. The final stop will be in Hartford, Connecticut on November 14! 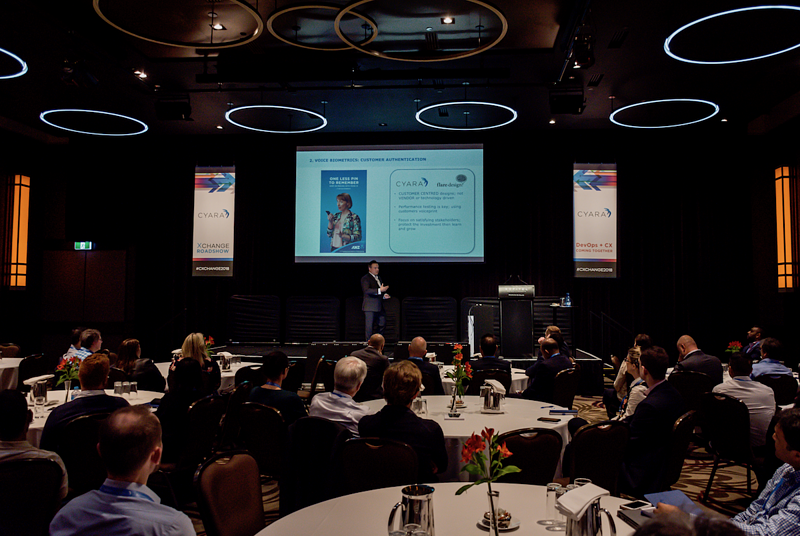 In this post, I’d like to spotlight one of our most popular customer presentations, Understanding and Delivering an Assured Customer Experience, by Matt Butler, Senior Channel Development Manager, from ANZ Bank, New Zealand. Matt spoke at both our Melbourne and Manchester Xchange 2018 Roadshow events. As with so many CX leaders, ANZ was looking to differentiate based on their customer experience. This involved developing customer journeys that spanned seven communication channels for a more connected customer experience. With 2 million customers making 450,000 unique journeys per month, as well as the continual focus on cost and speed to market, this was not an easy task. And Matt’s team faced a challenge that might be familiar to many of you: they had to prove the need for funding for a project in a non-digital channel. To make the business case, they set out to answer the question: How important is a human touch in a digital world? They wanted to analyze which customers were engaging with humans, and for what reason. They reasoned that if they understood this, they’d understand the importance of non-digital channels in delivering the overall customer experience. This analysis was key to making the argument that non-digital channels, and the contact center in particular, were key to the bank’s ability to deliver a great customer experience, and helped Matt’s team get the investment they needed to improve human-assisted customer experiences. ANZ was looking to make it easy for customers to authenticate over the phone. These customers were already used to easy, yet secure, authentication in other channels. At the time, 60% of customers coming through the mobile app were using fingerprint or face ID, instead of their customer number. Performance testing was key. 500 staff helped with voice prints, which allowed them to understand how the solution was performing. Test automation enabled them to iterate and test on the fly without slowing down the project. The aim of the speech recognition project was to provide an easy, intuitive way for callers to accomplish their goals by capturing why people were calling, and route them to the right experience. This would be accomplished through a one-question speech IVR. Prior to this project, the ANZ customer experience was very product-centric with a simple IVR that just said “do you want to talk to someone about home loans,” then press a button. This was not only a poor customer experience, but it provided agents with very little context about why customers were calling. Cyara was key in the success of the MVP. With Cyara, ANZ was able to quickly build a set of regression tests, based on actual customer requests for different journeys. From there, ANZ could test real-world scenarios end-to-end—through to the agent and agent desktop—and even manage paths that based on variable responses. Not only did Cyara testing help assure that the system works, it also provided the business with clarity that the vendors were adhering to their system performance statements. By automating testing, ANZ saved costs, and reduced the time to test. The new system was easy to roll out and had strong staff advocacy (9.5/10) from the outset. Matt’s overall key takeaways were to design with improved CX as a primary objective because a vendor- or technology-driven objective would have yielded different results; to be innovative; and to create test scenarios to test as many real scenarios as possible. He also found that performance and volume testing were critical. You can watch the video of Matt’s presentation here. And, to learn more about how Cyara can help you innovate your customer experience, contact us today.